Since nothing says "being a writer" like having a good excuse not to write, I spend a little time during the holiday creating a Character Name Generator for my own amusement and use. It’s not fancy and is a little rough but it does what it needs to do; if you need to generate names for fun or work you might find it useful as well. the generator will randomly choose entries from the lists you’ve chosen and return twenty-five names and place them in the "Generate Names" list. Once you have the names you may add them to the "Saved Names" text box by clicking on the little + next to each name. You can also "play" with the names by dragging parts of them around and dropping them on other parts. Note: you need to drop the name directly on top of the name you want to swap with – not just the box in which the name is located, but on the text itself! 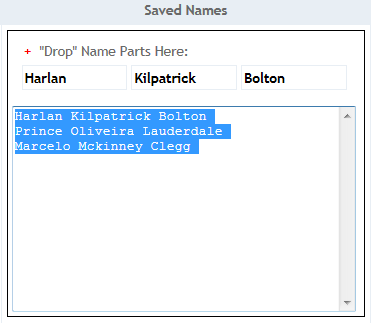 There is also a dedicated "drop zone" for name parts located above the "Saved Names" text box, Again, clicking the + will add the name to the Saved Names text box. You should save you name choices by selecting the names in the Saved Names text box and then use your browsers copy command. Paste the names into any desktop application or browser window that accepts text. The names are generated from about 4200 female and 1200 male first names taken from the 1990 U.S. census, the surnames are from the approximate 150,000 names in the 2000 census. While I am sure that new names have arrived since these census I doubt there are a statistical number of them that would somehow make this name generator "out of touch" with today’s names. In any case we use a random number generator to choose the names and so we don’t take usage into account except for the selection of surname lists.